I can’t think of anything classier than a cheese & charcuterie board for entertaining or to enjoy for a couple’s night in. Todd and I have a tradition where a few evenings a month, after the kids are in bed and all is calm, we assemble a cheese & charcuterie board together and then sit down to enjoy a quiet evening of great food and conversation. 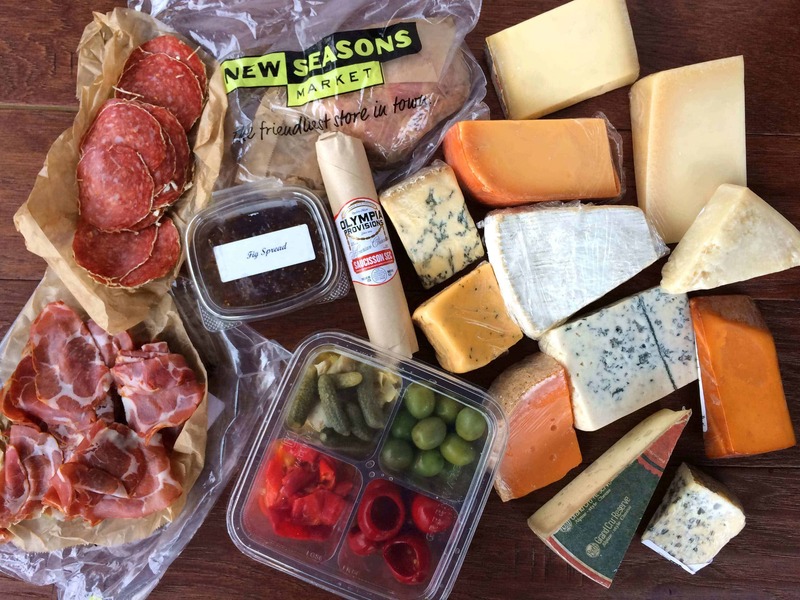 Creating a cheese & charcuterie board is easy and quick. And while there isn’t necessarily such a thing as “wrong” when it comes to the choice of ingredients, there are a few general pairing guidelines that will ensure the flavors complement rather than compete with each other. Today I’m going to take you through a general overview and offer a few suggestions. The first thing I want to emphasize is the golden rule of cheese & charcuterie boards: Simplicity is best. And that’s something the experts agree on. That already makes your work easier – you don’t have to fuss over gathering up a ton of ingredients and spending your paycheck on a dozen or more different cheeses, meats and condiments. Having too much will overwhelm your guests and their palates. No, you want to select and showcase a few, high quality items and let your guests savor them without too many choices competing for their attention. With that in mind let’s get started. 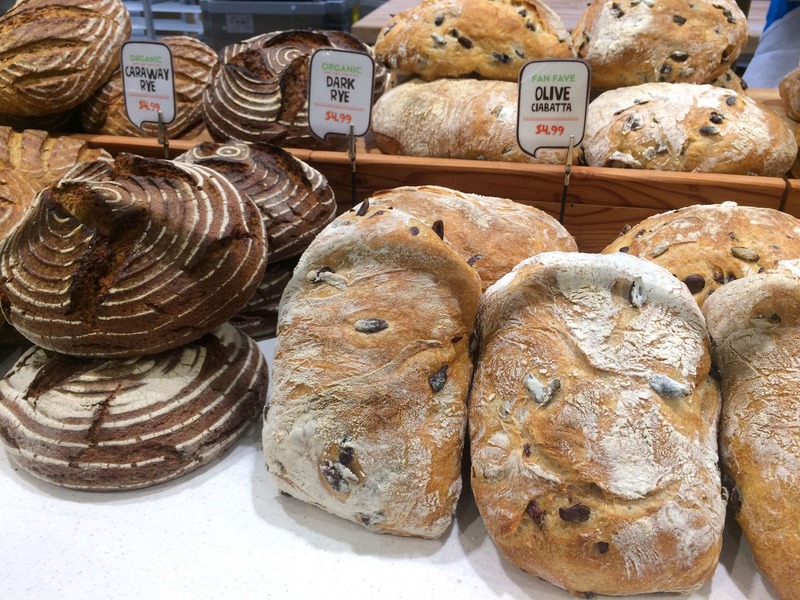 I’m going to use my shopping experience at the New Seasons Market on Mercer Island (off the i-90, a ¼ mile south of exit 7a) to illustrate how to select the ingredients. Let’s start with the cheese! When I first moved to the U.S. from Europe twelve years ago and saw what Americans pass off as cheese I thought I’d go crazy with the limited options. Even many of the imported cheeses didn’t taste the same because of the FDA regulations around raw milk (the key to flavorful cheese). I longed to be back in Germany, England, France and Italy where I could enjoy the good stuff. Fortunately two things have been happening in recent years: The FDA has been loosening up, a bit, as they’ve recognized the superior flavor and health benefits of raw milk cheese; also, there has been in increase in artisanal cheese production in the U.S.. 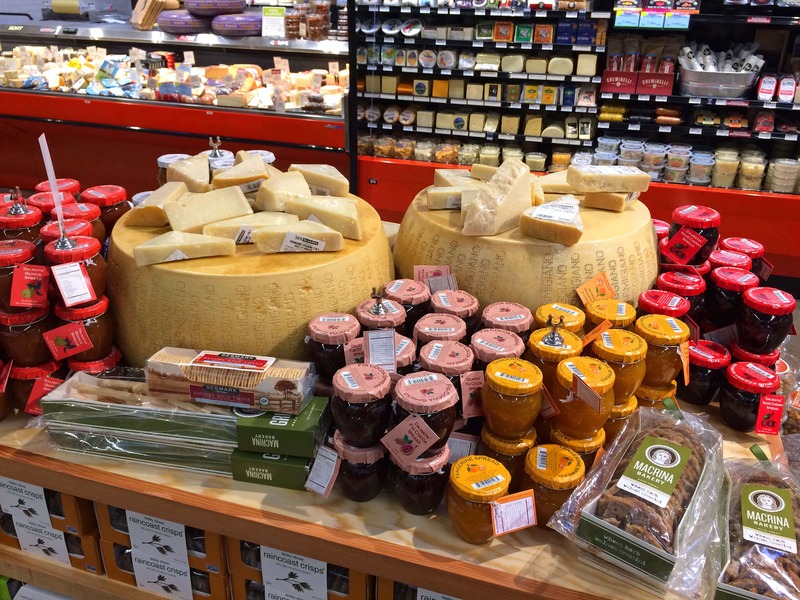 So now when I go to specialty cheese shops or unique grocery stores like New Seasons Market that have an excellent selection of quality cheese, I can enjoy both the great European-imported cheeses along with an absolutely fabulous selection of domestic artisan cheeses. 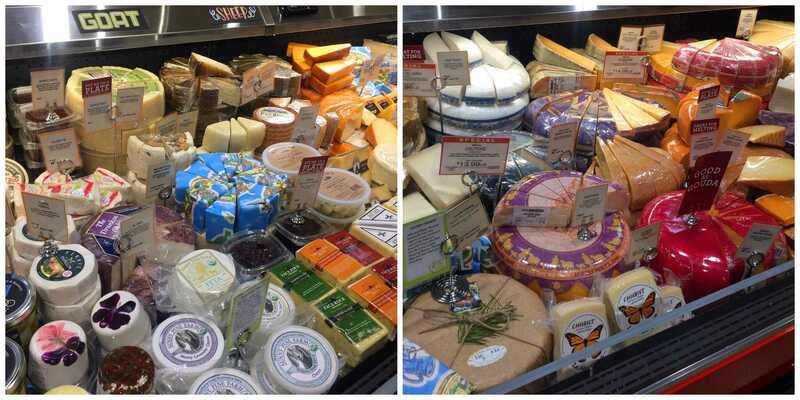 Below is just a small taste – a tiny fraction – of some awesome local/domestic artisan cheeses I found at New Seasons. So let’s talk about how to select cheese for your board. How many different cheeses should I choose? Most experts agree that no cheese board needs more than 3 cheeses, maybe four if you’re feeding a crowd. More is not better, it’s taste bud overload. How do I know which cheeses to pair with each other? Think about it in terms of boldness of flavor – it’s nice to have a spectrum of more mild to strong. Here’s one obvious example of a combination that isn’t ideal: Stilton, Danish Blue and Gorgonzola. Not only are they all different kinds of the same cheese, they’re all very bold cheeses. Serve all three together on a cheeseboard and that is bold flavor overload. Instead, just as one example, you can arrange something like a blue cheese, a double-crème brie and an aged gouda – different types of cheese across the boldness spectrum and with different textures. It adds a nice variation to go for something with a soft, “bloomy” rind (e.g., camembert or double-crème brie), a semi-hard cheese, and a harder, aged cheese. A fresh, spreadable cheese like chevre is another great option to include. Another option is to arrange the cheese around a particular theme. For example, by country: French, Italian, Dutch, English, German, American, etc. or by type of milk (cow, sheep, goat, kangaroo…who knows, that may just exist). When you really begin delving into the cheese selection and realize just how many there are it’s almost dizzying. That’s where the cheesemonger comes in (that’s the funny name of the person behind the cheese counter). A knowledgeable cheesemonger is your best friend. The cheesemonger can see the full picture. They can pick up a chunk of cheese and readily make recommendations for other cheeses to pair with it and what to serve with them – slices of pears versus crackers or baguette; the best fitting jam or honey; options for fruits and pickled vegetables; beverages that pair best with that selection; the best kind of charcuterie, etc. Or you can tell them what kind of theme you have in mind and they can help you build your platter with a snap of their fingers. I spent a good 45 minutes at the cheese counter chatting with New Seasons’ very knowledgeable cheesemonger and came away with some great recommendations and a great education. Ask for samples. Good cheese is expensive and you want to make sure you’re happy with your selection. If there are cheeses you’re unfamiliar with (there’s bound to be at least several of those), be sure to ask for samples. At New Seasons I didn’t even have to ask; as soon as I started asking them about a particular cheese they immediately asked if I wanted to sample it. And I sampled about five different cheeses before making my selections. A note about the cost: You know your budget and you know how many people you’ll be serving. If the wedges of cheese are too large for your party and you don’t want to spend the extra money to have leftover cheese, ask the cheesemonger to cut you a smaller wedge. That way you can enjoy a selection of a few items for less than you otherwise would have paid. That’s just a fancy word for pre-cooked cold meats. 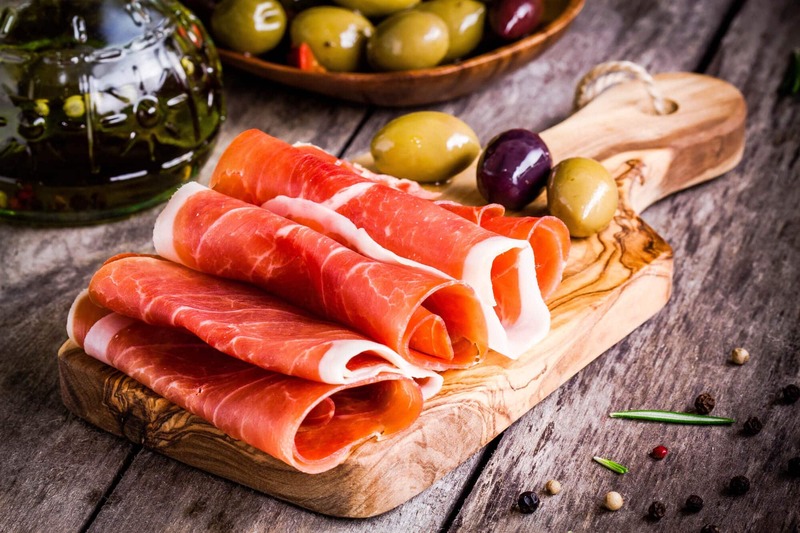 For your typical meat and cheese deli trays accompanied by rolls for making sandwiches, meats like ham and turkey are perfect. But for charcuterie boards you want to feature cured meats. What kind of meat should I include? Like the cheeses, it’s nice to include something a little milder along with something bolder. 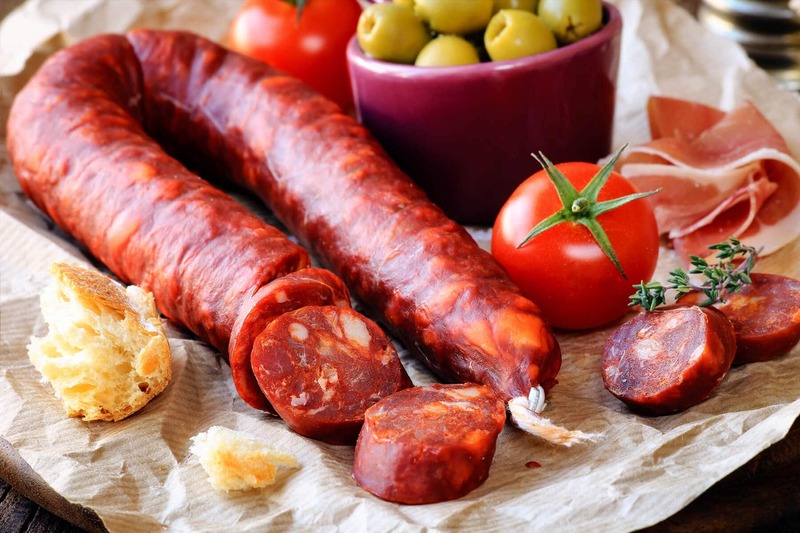 Some great choices include hard salami, Spanish dry-cured chorizo, sopressata and cured whole-muscle meat that is shaved thin like prosciutto or jamón Ibérico. A pâté is another option that offers texture variation; a soft, spreadable mixture of ground meats and other ingredients like vegetables, nuts and herbs. How much meat should I serve? Charcuterie is pretty rich and the general recommendation tends to be about 2 ounces per person if you’re serving it as an appetizer. The same is true for the cheese. If you’re serving it at a cocktail party where the charcuterie is the bulk of the food for the evening, then you can double it and serve it with plenty of bread. As with the cheeses, be sure to ask for samples of the meats in the deli case. I sampled 3 different meats which was extremely helpful in making my selection. 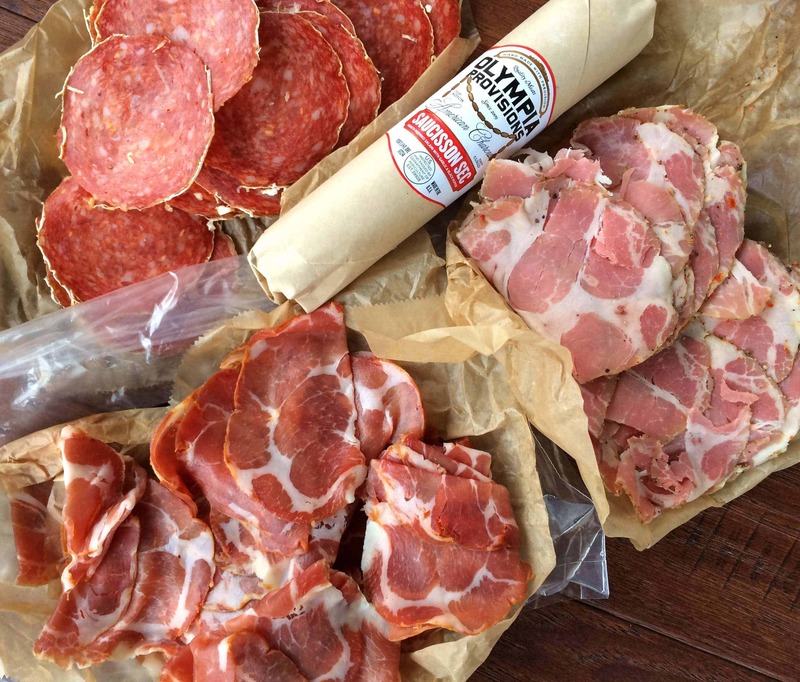 Some charcuterie comes pre-sliced in meat cases. Depending on how many guests you’re serving it may be just the right amount or it may be too much if you’re serving just a few people. That’s where the deli department is especially helpful because you can select however little you want. On this last trip I picked up a very small stick of saucisson sec (a French salami) from the specialty meat case and from the deli department got some hard some salami and sopressata sliced to my specifications. 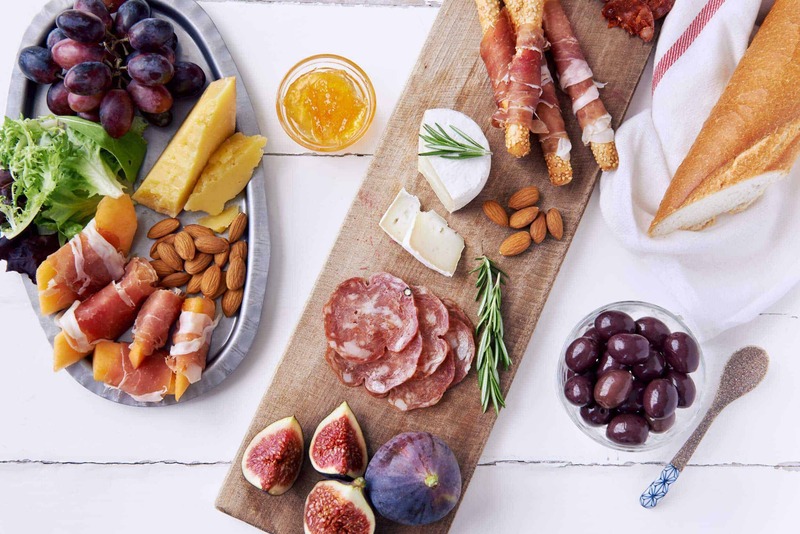 As a general rule (there are exceptions), cheese pairs especially well with sweet things like fruits, honey and jam, while the meats pair with the savory and briny items like olives and pickles. Grapes are a classic accompaniment to cheese that add both sweet and crunch as well as visual appeal. Other great fruit options include fresh figs, cherry tomatoes, slices of pear, apple or melon. 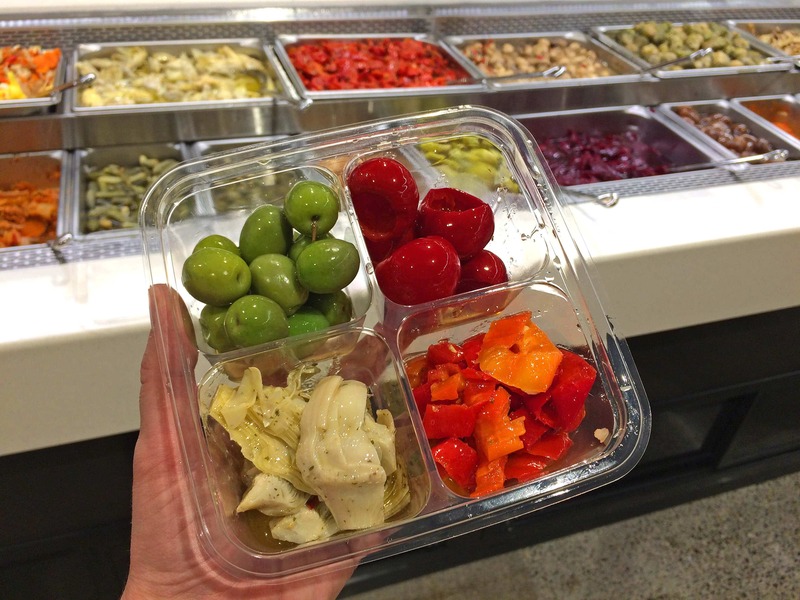 For the savory/acidic selection, besides the already-mentioned olives and pickles, other great options are marinated artichokes, pickled onions, and pickled peppers (they don’t have to be Peter Piper’s, a generic brand will do). Another favorite is pickled asparagus (click for the recipe to make your own!). 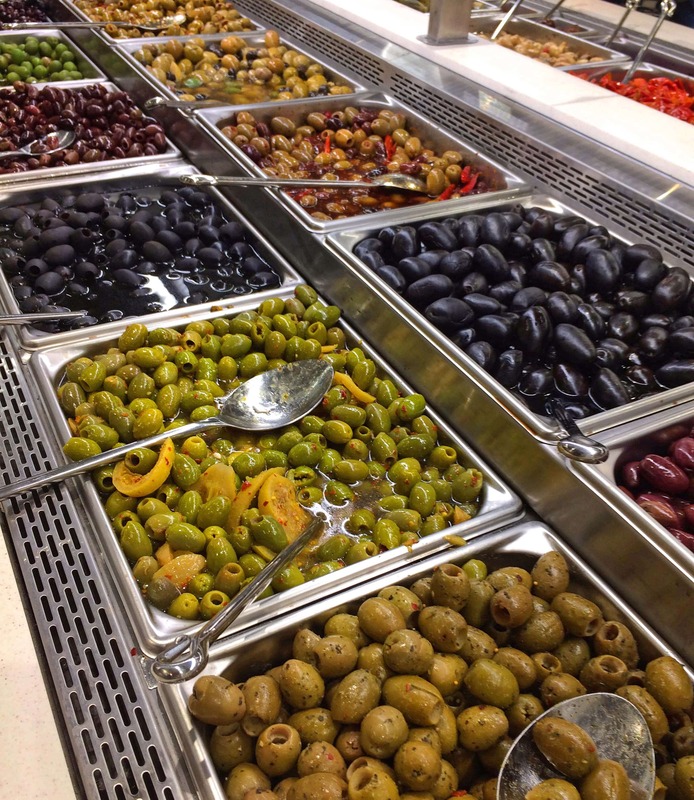 You can also make your own gourmet marinated olives. 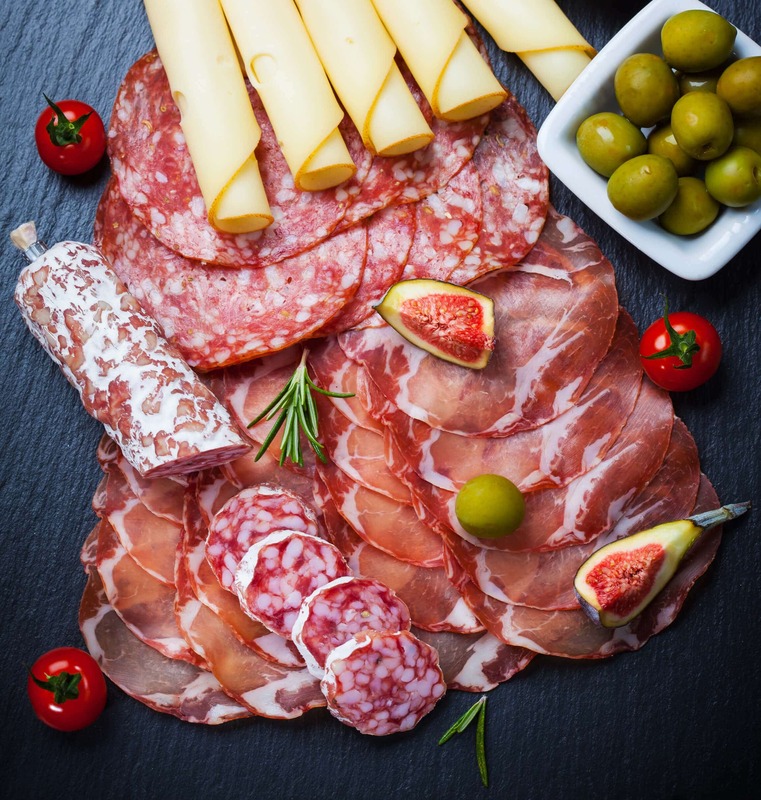 These accompaniments serve several functions: They provide sweet and briny contrasts to the cheese and meats; they heighten the flavors of the cheese and meats; they add variety of texture as well as add color; and they serve as palate cleansers between bites. As with the cheese and meat selections, keep things simple. Choose one or two savory/crunchy items and one or two fruits. Finally, nuts are always a great addition and contribute the must-have “crunch” to any cheese and charcuterie board. Marcona almonds and walnuts are classic options. The selection of the best European imports and locally-made condiments at New Seasons is awesome and I wanted to take them all home with me. But just stick with one or two condiments like one sweet and one savory option (e.g., a stone-ground mustard). The most classic and versatile jam is fig. It’s kind of your one-size-fits all condiment for cheese. The brighter, fruitier jams, like sour cherry, are particular great with soft fresh cheeses like chevre. Honey pairs really well with aged cheeses like Parmigiano-Reggiano, alpine cheeses like Comté and Gruyère, and with tangy cheddars. And remember, if you feel stumped about what to choose, utilize the cheesemonger – they’ll be able to make very specific recommendations for which condiment will pair best with your cheese selection. As far as I’m concerned, nothing beats a chewy, crispy bread to accompany a cheese or charcuterie board. I picked up a French baguette from the New Seasons bakery and it is hands down the best grocery store baguette I have had. Chewy and springy on the inside with large airy holes and crispy on the outside – not the dry, lifeless mouthful of bread you get elsewhere. Slices of fresh baguette or small slices of another good crusty bread will always be a welcome sight on any cheese and charcuterie board. But you can offer both bread and crackers if you prefer, especially for guests who are gluten-free. There are some great gluten-free cracker options out there. I found brands I’ve never seen anywhere else. And depending on your cheese selection you may even choose to go completely grain free and use something like pear or melon slices for your cheese & charcuterie board. Or you can feature both baguette and a fruit, for example. This is the easy part because when you have ingredients that are inherently beautiful by themselves (cheese, cured meats, colorful fruits and vegetables), it’s hard to mess up the appearance of a cheese & charcuterie board. Below are just a couple of tips. Should I pre-cut the cheese or serve it as the whole block? That’s a question that even the experts debate amongst themselves. Some hold that the whole chunk is more aesthetically pleasing and that the eating experience is enhanced if there is some interaction in slicing your own cheese while other experts argue that the food should be easily accessible without holding others up; that the experience should be smooth and hassle-free. If you have large enough wedges so you can lay an extra chunk of it next to the pre-sliced pieces then you have both the aesthetics and practicality (you’ll also need a larger board). Otherwise, I tend to lean in the direction of making the experience fuss-free for your guests. If you are going to put out chunks and have your guests slice the cheeses themselves, lay out a separate cheese knife for each cheese so that the distinctive flavors and textures of each cheese are not intermingled. To slice or to cube, that is the question. Some experts recommend not cubing the cheese (i.e., resembling your kids’ after-school snack), but rather stick to small wedges and strips that can be eaten in 1-2 bites. Within the selection you want to have elements of savory, salty, smoky, sweet and soft and crunchy. And you want color. Should I serve the cheese and meats cold or at room temperature? Both the texture and flavor of cheese is superior at room temperature so set the board out 30-60 minutes before you intend to serve it. For meats 15 minutes at room temperature is adequate. Now for the final aspect: What are you going to serve it on? If all you have is a plain white platter will certainly work just fine. But a nice board is at least half the presentation and will make everything on look gorgeous. For a warm and rustic feel you can never go wrong with wood, it’s the most popular and classic choice. It can be any kind of wood. 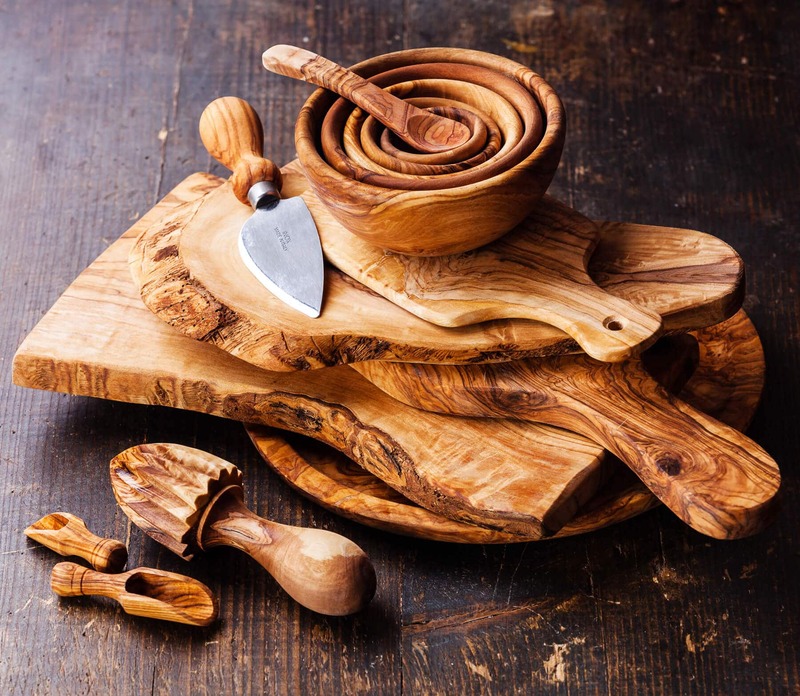 I rotate between bamboo, hardwood and I especially love anything with olive wood – all the swirls and light and dark color variations can make even the simplest of presentations look stunning. Conversely, all the beautiful ingredients can compensate for even a very plain board and make it look impressive. Another popular choice for a more modern/contemporary look is slate. If you’re going for a particular theme you can consider that as well. I smiled when I saw a cheese board at New Seasons cut in the shape of Washington State. They also had some handmade ceramic condiment dishes made by local artisans that would serve perfectly for the jam or other accompaniments. They also have every cheese knife you could possibly need that will make your preparation easier. If you’re not going to pre-cut the cheese on your serving board, be sure to put out proper cheese knives that are made to glide through so your guests aren’t having to struggle cutting a hard gouda with a regular paring knife. I know I will! Here are just a few of the goodies I brought home with me. Our family enjoys sitting down to a cheese & charcuterie board on a frequent basis so I brought home enough to enjoy different sets of cheese each time, centered around different themes. Plus with New Year’s Eve approaching there’s no better way to ring in the new year than with a bit of class! 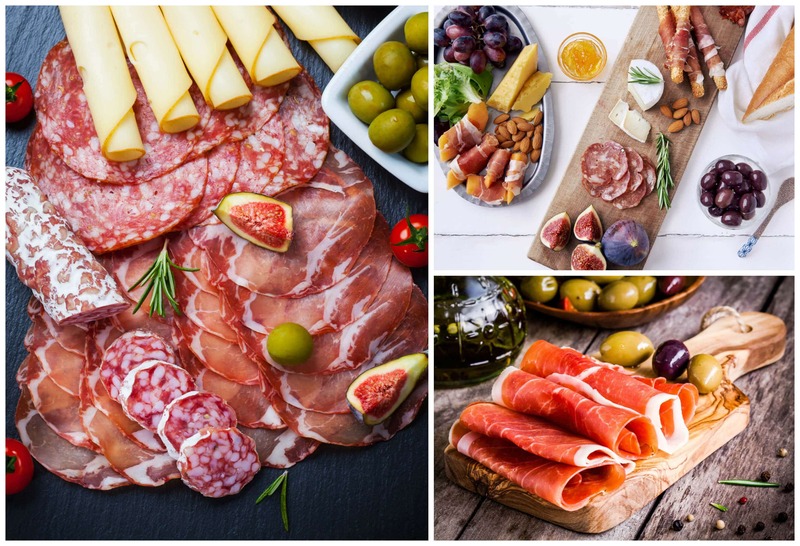 And now it’s your turn to share your tips and tricks for creating a great cheese & charcuterie board for entertaining! I could live on cheese and charcuterie boards! This is gorgeous, including that lovely wood. Such great information! I always buy way too much, so your tips are so appreciated! This is by far the most comprehensive and helpful post I’ve ever read on the subject of creating a cheese and charcuterie board. Tons of great and helpful tips, thanks so much. I’m going to put one together for New Years!! Wonderful, Cori, I’m glad you found it helpful. Have fun creating your cheese & charcuterie board and Happy New Year! Not only is it delicious looking, you’ve outdone yourself with the utter artistry in putting it together! I loved this article. I have never seen things broken down and explained so clearly. Now I know step-by-step what to do including presentation. Thanks and Happy New Year to you and your family. Yessss!!! My favorite party of any party. I could eat cured meats and cheese all day long. Beautiful, classy, timeless and oh so very tasty. Reminds me of Alsace, or a bistro in Paris, a downstairs tapas bar in Madrid or sitting in an outdoor cafe (taverna) in Greece or the Algarve. Add some pates/terrine and some confit and just call it a meal! This post is outstanding. So much valuable information and such artistic presentations. Will this stay on your website for future reference? I want to be able to look at the pictures in the future for inspiration. Thanks, Leslie! Yes, all of my posts and recipes remain on my site permanently. Happy New Year! This is always such a great idea for parties! 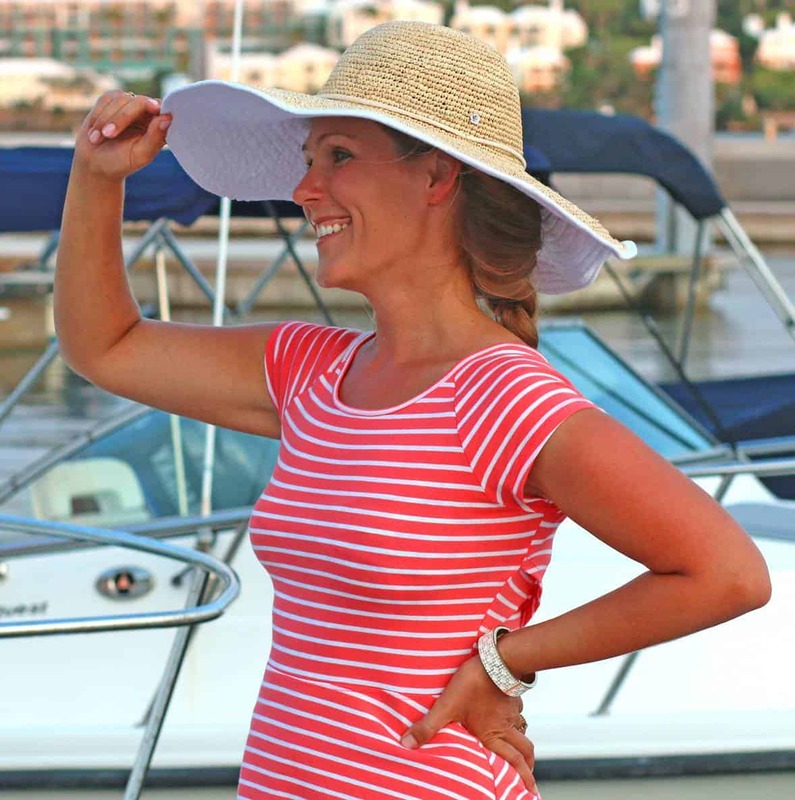 Simple, elegant and fun! Great ideas, I love to make cheese and charcuterie. Simplicity is right!! I love this- so helpful! I could live off this board! I love your detailed pictures! What a beautiful party platter….this will definitely make your party guests happy. Gorgeous photos too :-). I love boards like this! We actually had one like this for lunch today! What an awesome post! So much great info and it all looks incredible! A charcuterie board is my go-to when entertaining! :) I love to have one ready to go and sitting out when guests arrive. Sometimes I make one up for my family just to have for dinner. We call it a “snacky” dinner, lol. My husband and I do this as a date night in all the time! It’s our favorite! If there was a last meal request I would want everything I just saw in this cheese and charcuterie board. I’m completely in love!! I’ve searched for a “guide” to creating a well balanced charcuterie board and this by far is the most informative! Thank you for taking the time to create this article. This is such a great post, Kimberly. I had no idea about assembling a charcuterie platter until now! Similarly, I also miss the great, flavorful cheeses I had living in France. When I lived in Lille, my friends introduced me to le maroilles (one of my favorites), and they wondered if I was really American! Agreed, Edward! 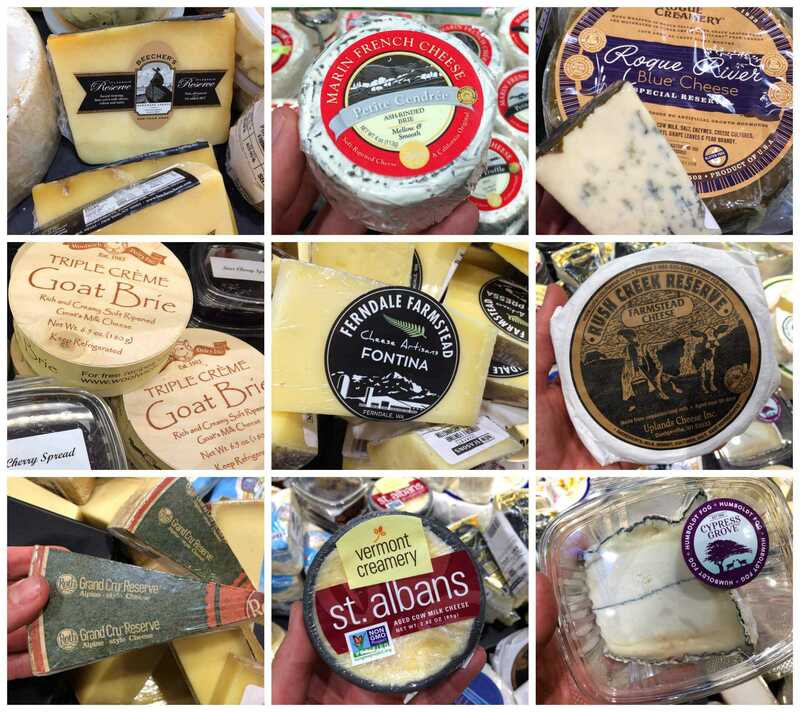 I’m just glad that more stores in the U.S. have started importing a wide variety of European cheeses and I’m also grateful for some really excellent U.S. artisan cheesemakers – I couldn’t live without cheese!